Not very comforting, is it? Back in the winter, we mentioned that the IRS anticipated that the entire withholding process would change, beginning in 2019, thanks to the Tax Cuts and Jobs Act. 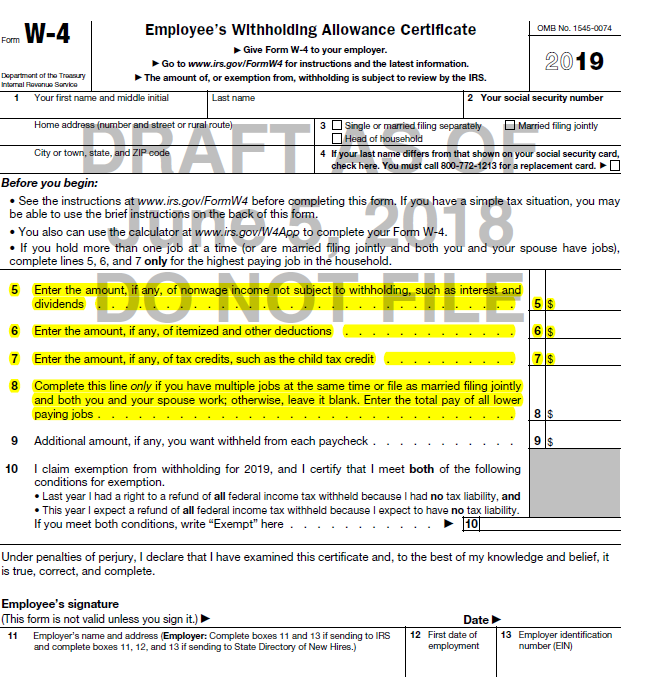 Apparently that’s true, if this first draft of the 2019 W-4, which the IRS released last week, makes it into prime time. In a bit of good news, the draft form is ahead of schedule. At the American Payroll Association’s annual Congress last month, Acting IRS Commissioner David Kautter said the form wouldn’t be ready until much later in the year. We’ve been saying for a while now that tax reform will fundamentally change payroll administration. Crux for Payroll: the shift to adjustments to income and credits, from adjustments to income and tax. One look at the draft W-4 tells us that’s true. We’ve highlighted the new lines.